When it comes to drones, do Americans really care about international law? If the American public is really as disengaged from foreign policy as we think, how much can they really know—or care—about international law? In reporting on their fascinating and important research on international law and US public support for drone strikes, Sarah Kreps and Geoffrey Wallace find that US citizens are surprisingly receptive to arguments that drones should not be used because they violate international law. Their compelling findings make valuable contributions to debates about the power of international law in everyday politics, but some key omissions leave their conclusions open for debate. Do American voters support drones even when compared to other options? And perhaps even more fundamental, why do they care about international law at all? Kreps and Wallace are fundamentally interested in the following question: if we tell US voters that using drones violates international law, will they be less likely to support the use of drones? They set up a survey experiment that contrasts international law frames with prompts about the efficacy of drone strikes. Efficacy is chosen as a comparison because there is a robust literature arguing that public opinion is most likely to favor the use of force when the public believes that the political aims of force are achievable. Missing from Kreps and Wallace’s analysis, however, is how and whether the prospect of casualties incurred—and not just casualties inflicted—might affect public opinion regarding the use of drones. Indeed, the “pretty prudent public” argument—that public opinion on use of force changes depending on the principal objective—was a direct reaction to the casualty aversion thesis—the notion that, the more military casualties are sustained, the lower public support for the use of force. Because Kreps and Wallace do not consider alternative military options—specifically, ground troops—we cannot know to what extent voter preference is driven by respect for international law versus a desire to minimize US casualties. 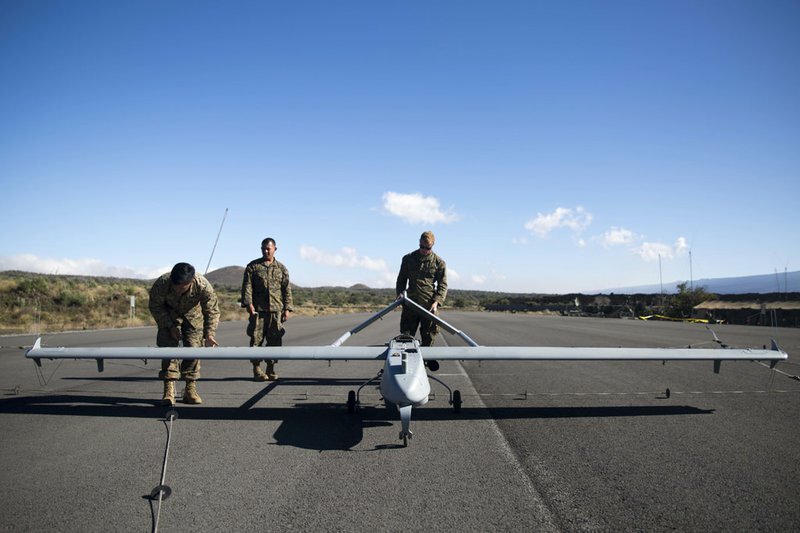 US Marines inspect a surveillance drone between missions in Pohakuloa, Hawaii. This omission is a critical one precisely because US drone strikes do not produce US casualties (with the exceptions of the few US citizens who may be killed by drones and PTSD and fatigue as suffered by drone pilots). The low-to-no casualty rate is considered to be one of the main advantages of drones. Today’s drone program contributes to a longer-term trend of decreasing US fatalities in war driven by military and medical technology. One argument in favor of the use of drones is that they can reduce the human and financial costs of war by decreasing fatalities and mechanizing the application of force such that fewer military personnel overall are necessary. Drones reduce the aggregate cost of salary and benefits—including health care—for the military. If policy makers prefer drones as a cost-saving measure, it would be important to understand to what extent the public shares this perception. To make this assessment, we would have to compare public support for the same military strike, but where a drone is used in one case and ground troops in the other. Many of the same arguments about the violation of sovereignty as well as international humanitarian law could be applied to either scenario, and we would have then have a sharper sense of the role of international law in this case. How much international law does the public really know? If the average voter doesn’t seem to care about foreign policy, how much do voters really know about international law? The US public has a reputation for being disengaged from foreign policy. A 2013 Pew Poll found that just over half of respondents thought the US should “deal with its own problems” and let other countries handle their own issues “as best they can.” Even more stark, when the American public was asked what President Obama should focus on in January 2013, 83% said domestic policy while only 6% said foreign policy. The question that Kreps and Wallace must address is this: if the average voter cannot name the president of Russia and doesn’t seem to care about foreign policy, how much do voters really know (or care) about international law? More important, Kreps and Wallace’s intriguing results raise the question of why voters value compliance with international law. The finding that they do care about international law runs against conventional wisdom, which is part of what makes it so appealing. Has the US public’s value for international law changed over time such that it is more appealing today? If so, why? Are certain voters more likely to value international law than others? The relationship among the use of drones, public opinion and international law also raises questions about other emerging technologies, such as cyber and lethal autonomous weapons systems (LAWS), or “killer robots”. The asymmetric nature of casualties incurred versus casualties inflicted, as well as the vagueness of international law, are issues pertinent to all these technologies, but to different degrees. Cyber attacks are least likely to cause direct casualties, if they cause casualties at all, while the concern about LAWS is that these machines could decide on their own to conduct attacks with significant collateral damage. Jointly examining public response to the use of these technologies would afford the opportunity for some fascinating comparisons, as today there is one widely-read legal manual on cyber and international law, no such manual for drones, and certainly none for LAWS—a technology not yet in existence. If the public cares about international law and the use of force, comparing reaction to the use of these various technologies in terms of respect to international law could help clarify why the public cares about international law. Such results could then help pave the way forward for civil society and government policy makers trying to navigate this new technological—and legal—landscape.